One of the more confusing terms in cooking is a "bain marie." This French word describes a cooking utensil and a technique and has a specific meaning. A bain marie (or bain-marie) is a utensil and a cooking technique. 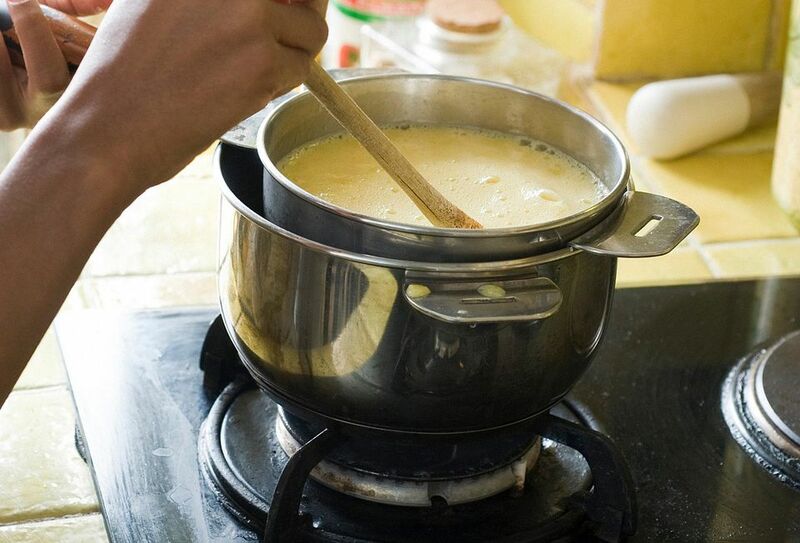 Most often, it is simply a double boiler. It is two pots; one slightly smaller than the other, that are fitted together and used to melt delicate ingredients on the stovetop. The larger pot is filled with water, and the smaller pot is put on top. The ingredients are put into the smaller pot. The water shields the ingredients from the direct heat of the stove, so the food doesn't scorch, curdle, or burn. This method of cooking surrounds the food with very gently heat. A bain marie is used to melt chocolate, to make delicate custards, white sauces, and to cook eggs and other foods. It is also called Mary's bath. When used in a recipe, this is the format: "Combine the eggs, milk, and sugar in a bain marie and cook over barely simmering water." What Does Tempering Mean in How Do You Do It?